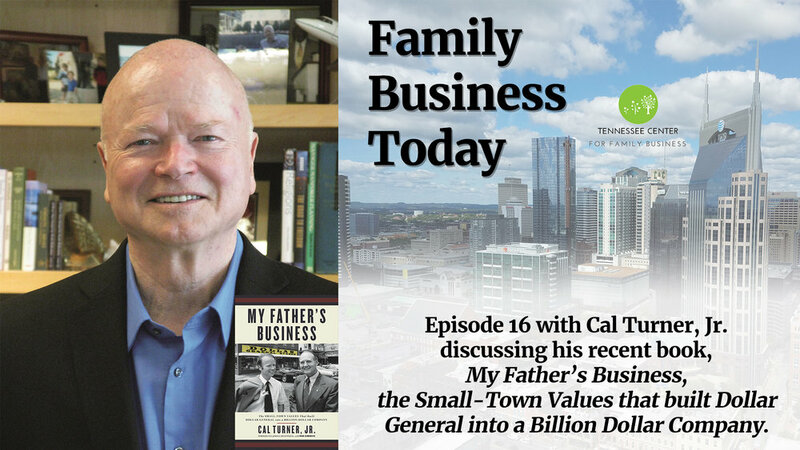 Episode 16 Cal Turner, Jr. discussing his recent book, My Father’s Business, the Small-Town Values that built Dollar General into a Billion Dollar Company. On today’s podcast we will be talking about Cal’s trials and tribulations both within his family and within his family business, Dollar General; what he learned; and how his experiences working in a family business might benefit you where you are today in your family business. Cal Turner, Jr. grew up in a Scottsville, Kentucky household where business and family were one. After graduating from Vanderbilt University, he served three years as an officer in the United States Navy before beginning his career at Dollar General. He served as CEO for 37 years and during his tenure the number of Dollar General stores rose from 150 with sales of $40 million, to more than 6,000 with sales in excess of $6 billion. · Why was it important to write this book about the Turner family business now? · What is the significance of the terms “an old man’s caution” and a “young man’s ambition”? · How did your desire to be a people pleaser influence your relationships with family, employees, board members and investors when you eventually took over leadership at Dollar General? · What were your mom’s 3 rules about fighting? · What advice would you give a father/mother whose work defines them about letting go and allowing the next generation to carry on the legacy? · Why is philanthropy so important to your family business? If you have a question about working in your family business or succession planning, contact us at info@tncfb.com. Older PostEpisode 15: Greg Lewis with David Wells on “Family Governance – What it is and Why it is important for a family business to have a governance model”.